The colorful illustrations, the rhythmic words, and the familiar animals make Brown Bear, Brown Bear, What Do You See? by Bill Martin Jr. and Eric Carle a favorite picture book. On each page, the reader asks an animal what he sees; the animal responds with another animal. In the end, the students in a classroom are the ones seeing all the animals. But such a simple concept is not the only thing that gives magic to Brown Bear: each page has a rhythm to it. I see a yellow duck looking at me. The sequels to Brown Bear are not as captivating. One successful sequel is Polar Bear, Polar Bear, What Do You Hear?, in which each zoo animal makes a noise. The rhythm is not as appealing, but the gorgeous animals and the sounds they make are. In the end, a zoo keeper hears children trying to make all of those same sounds. Macaroni penguin, macaroni penguin, what do you see? That leaves me cringing as I stumble over it to read aloud, and I doubt it would captivate a younger audience. 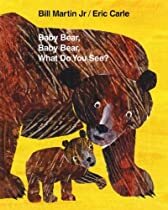 The final sequel (thus far) is Baby Bear, Baby Bear, What Do You See?, which features animals from North America. It also felt like it had some agenda, and the animals weren’t delightful, nor did they fit the rhythm. 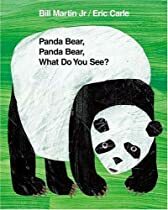 If you’re looking for a delightfully illustrated, rhythmic book to read your child, all the while learning colors and animals, I’d suggest Brown Bear, and maybe Polar Bear. Eric Carle’s illustrations are classic, and the rhythm makes them a fun bedtime read aloud. They also are available in a board book format. Is Brown Bear a favorite in your home? Which of the sequels have you read? Do you like them? We did love these books! The only thing I remember is being irritated because some (all?) of them are geared to a school audience–“teacher, teacher, what do you see?” which always surprised me at the end! The macaroni penguin line drives me crazy too! Ah, this brings back some memories. My son used to love the Brown Bear book, over and over and over again when was under 2. SmallWorld Reads, only Brown Bear is a school, with “teacher, teacher” and “children”. Polar Bear is a zookeeper and children, Panda Bear is a “dreaming child,” and Baby Bear it’s the mother seeing her baby bear at the end. Chain Reader, like I said, I think it was a nice idea that just fell flat in this format! What were they thinking? “Macaroni” penguin sounds like food to a 2-year-old! Book Dads, ah I’m glad! I’ll need to keep reading it to my son, as he’s that under-2 age right now! I have 2 little granddaughters who have each just turned 1 ~ this would be an adorable book for me to get for them for Christmas ~ thanks for the great idea! Christy H., I hope your granddaughters love it! the whole thing is illogical. the first page says Brown bear see a red bird “looking at him”. when asked, the red bird what does it see: it supposes see a brown bear isn’t it. May be the red bird looks away form brown bear just about when I turn the page, but that does not sound right. Why do it has to say looking me at the first place and left children to fill in that may be it just look the other way just now. They are many ways to rhyme. Why it’s got to be looking at me?